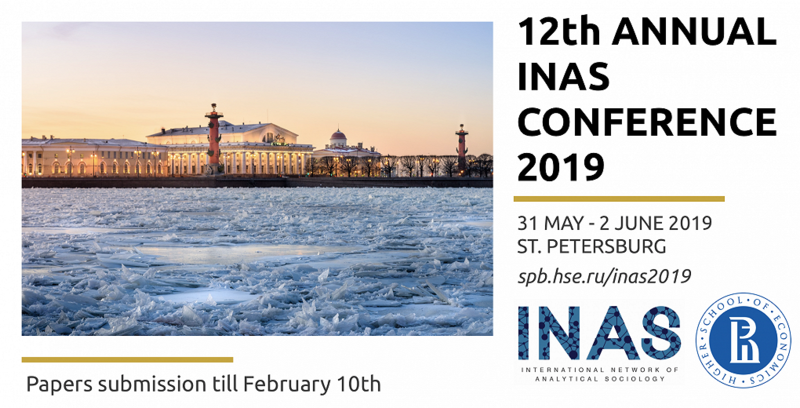 The 12th International Network of Analytical Sociologists conference is taking place in St. Petersburg this 2019 between the 31st o f May and 2nd of June. All the relevant information is going to be published in the official website, which you can consult here. Distinguished Professor at the Department of Sociology, Head of the Laboratory of Sociology in Education and Science. Head of the Department of Sociology, Associate Professor. Senior Lecturer at the Departments of Sociology, Junior Research Fellow at the Laboratory of Sociology in Education and Science. Senior Lecturer at the Department of Informatics, Junior Research Fellow at the Laboratory of Sociology in Education and Science. Research Assistant at the Laboratory of Sociology in Education and Science. The next Annual Meeting of the International Network of Analytical Sociologists is hosted by the National Research University Higher School of Economics, in St. Petersburg, between the 31st of May and 2nd of June 2019. Click here to go to the official website. Sign up to the INAS newsletter. Subscribe here by filling out your name and E-mail.